Attached are artists pictures which show the new hull design for the UK based P & O Cruises ships and also the new funnel design. 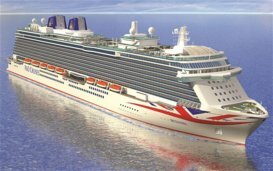 The hulls, which had been painted white with a yellow colour funnel, will have a design of the UK Union flag spread over the bow area and the wording ' P & O CRUISES ' added to the sides of the ships. The funnels will be painted blue with a bronze rising sun attached to the funnels. The first ship to appear with the new design will be the ' Aurora' which is due to be repainted on her next drydocking. Many UK website comments appear to strongly dislike this change in the appearence of the P & O Cruises ships which has been described as ' Ghastly and Garbage ' ! . The senior management of the UK P & O Cruises recently had some changes ! The main person now in charge had joined P & O Cruises from the Whitbread Brewary Group, who run Premier Inns, but was reported of having no experience of cruising ! This seems to be a costly waste of money which as a UK based shareholder I am not happy about ! They truly look pretty nice!!! 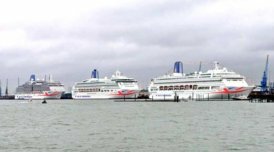 With a history going back over 175 years why change the appearence of the cruise ships on the British market and make them look like a cheap amusement park instead of a cruise ship with style ! 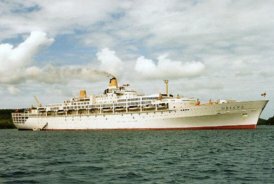 Picture shows the P & O Cruises 1961 British built 42,000 grt ' ss Oriana ' at Vava'u in the Tongan Islands. This ship set new records, when in service, for the fastest crossings of both the Indian and Pacific oceans which have still not been beaten by another cruise ship. Due to the amount of money spent on the ' mv Oriana ' at her last drydock, when she needed to be fitted with a ducks tail for a cure to stability problems, during her recent Caribbean cruise the ' Arcadia ' had her funnel spray painted blue at sea as she has not been drydocked for nearly five years having her original drydock cancelled due to the costs of the extra work on the ' mv Oriana '. Passengers complained that while this was done the sliding roof on the pool was closed to stop them getting sprayed with the paint but it also preventing them from sunbathing near the pool ! Not the way passengers should be treated when on a cruise from the UK to the Caribbean but it seems these days service standards on the UK P & O Cruises ships are slipping with passengers saying that the cabin stewards are overworked with the number of cabins they now look after and also in the main restaurants where the waiters now have little time to chat to their passengers due to the number of passengers they now serve !